Iowa's colleges and universities are helping prepare students for careers in traditional industries like agriculture as well as newer contributors to the state's economy such as healthcare and communication technology. The college landscape includes three public universities, almost 20 community colleges, over 30 non-profit private colleges, and several career and special-focus colleges. 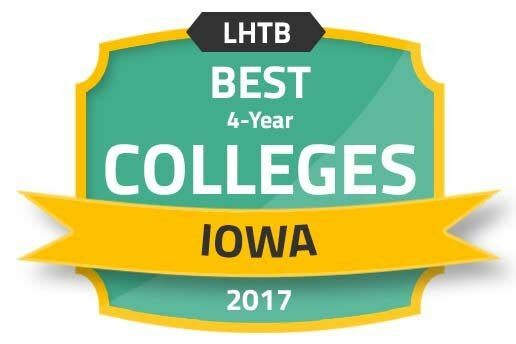 Read on to discover more about colleges in Iowa, including essential factors to consider when choosing a school and rankings revealing the best colleges in Iowa. All colleges in Iowa strive to provide the best education at the best possible price, but some do a better job than the rest. To create our ranking of Iowa colleges and universities for the 2017-2018 school year, we evaluated institutions on characteristics such as tuition costs, average earnings for alumni, how many students receive scholarship or grant aid (and how much they receive), and student-to-teacher ratio. Explore the Iowa's best colleges and universities below. The following search tool can be used to find colleges in Iowa based on tuition, type of school, location, student population, subject of study and degree level, and includes a map showing school locations and contact information. Using this data to compare Iowa colleges can help aspiring students identify which schools best fit their needs. Getting a college education and starting a career may seem unattainable to students facing obstacles such as learning, social, financial or family issues. Many aren't aware of the support and assistance available. Several federal and state programs exist to provide help, support and encouragement to those wanting a college education. Below are examples of programs in Iowa designed to make postsecondary education more accessible to all Iowa residents. This educational grant is available qualifying students who have aged out of Iowa's foster care system, or have been adopted from the system after the age of 16. There are other specific requirements regarding students' foster care status. They must also be between the ages of 17 and 23, and have filled out FAFSA® and Iowa Financial Aid applications. Grant funds – up to $9,010 per year – can be used for tuition and all college related expenses, including supplies, personal living expenses, transportation, housing and meals. The PROMISE JOBS program is available through the Department of Human Services and Iowa Workforce Development (IWD) and funded by the Federal TANF program. It offers family development, work training and other education services to families participating in the Family Investment Program (FIP). Participants will enter into an agreement with the state to complete specific steps towards becoming self-supported, based on the family’s needs. Some components of the agreement are education-based; participants may be eligible to receive help with education courses leading to high school diplomas, GEDs and post-secondary education programs. PLTW is a nonprofit organization that works with state leaders across the country to promote science, technology, engineering and math (STEM) skills among public K-12 students. PLTW programs help prepare students for postsecondary education and careers in STEM through courses in computer science, biomedical science and engineering. Eligible students apply those credits to a STEM degree at Iowa State University or the University of Iowa. Tuition is an important consideration when deciding on colleges. The amount students pay for tuition depends on several factors, including type of school, whether a student pays in-state or out-of-state tuition, and financial aid availability. The following charts break down costs using Iowa colleges' average tuition and fees, percentage of students receiving financial aid, and the nature and amount of that aid. One can also compare Iowa college costs to the national average. While tuition cost is often the standard by which colleges are rated on affordability, it isn't the only or best metric one should consider. The following section ranks the top six most affordable colleges in Iowa using net price (cost of attendance minus financial aid received) to give a more accurate look at out-of-pocket costs and also provides a comparison to the national average. One thing that many aspiring college students might not think about when researching colleges is alumni salaries. This is definitely something to consider, as it can give students a possible glimpse into their financial futures. The following section shows the top-six Iowa colleges with the highest paid alumni 10 years after college and compares them to national averages. Which Iowa College Alums Have the Least Student Debt? Another thing to consider when looking at the college finances is what student debt looks like for Iowa college grads. The following section ranks the six Iowa colleges producing graduates with the least amount of student debt and reveals how Iowa colleges compare to the national average. A key piece to the college-financing puzzle is students' cost-of-living. Students must look closely at what living expenses are like in various college towns as they can definitely impact overall college affordability. Take a look at the following table get a sense of cost-of-living in Iowa and its five largest metropolitan areas. Choosing an accredited college ensures that institution meets or exceeds specific quality standards in areas such as operations, curriculum, faculty, accountability, self-regulation and improvements. In addition to quality, accreditation comes into play when students transfer credits, or apply to graduate school, for financial aid or professional licensure. The regional accrediting body for colleges in Iowa is the Higher Learning Commission (HLC), which evaluates degree-granting colleges and universities in the North Central region of the United States. Individual programs within colleges can be accredited, as shown in the following two examples. Accreditation Council for Education in Nutrition and Dietetics (ACEND) The Didactic Program in Dietetics at Iowa State University is accredited by ACEND. American Psychological Association (APA): The Department of Psychology degree programs at Iowa State and at the University of Iowa are all accredited by APA. Drake is a private liberal arts university serving about 5,000 students near downtown Des Moines. The university has over 70 majors and a uniquely structured curriculum featuring the First-Year Seminar, Areas of Inquiry and the Senior Capstone. Students at Drake have several opportunities to work collaboratively with faculty on research and outreach projects, and can choose from over 160 student organizations. The Drake Law School and the School of Journalism and Mass Communication are popular here. Grand View is a private, Evangelical Lutheran Church-affiliated liberal arts university located in the heart of De Moines. The university offers about 40 majors, including an adult program with 16 evening majors. Grand View offers a flexible core curriculum focused on students' interests and specific outcomes, including career-development and community service. Popular programs at Grand View include business and accounting, nursing and education. Des Moines University's is an osteopathic medical school and health sciences university located near downtown Des Moines. It offers several graduate programs, including Doctor of Osteopathic, Podiatric and Physical Therapy Medicine degrees, and master's degrees in physical therapy, health care administration and public health. DMU also offers research-related degrees like the Master of Science in Anatomy and Master of Science in Biomedical Sciences. Other options: online master degrees, continuing education, and professional development courses. Iowa City recently ranked no. 13 on the American Institute of Economic Research's Top 75 College Cities and Towns in America list for small metro areas. Iowa City has one major public research university and a community college, but there are several other higher education options nearby. The University of Iowa has a large presence in Iowa City, contributing to the community and economy in several ways. Another fact that may be of interest to college students is that Iowa City is the only city in the United States awarded the City of Literature title by the United Nations Educational, Scientific and Cultural Organization. The University of Iowa is a large, public research university with a student population of about 32,000. There is a lot going on at UI, ranging from major research to world-class writing, visual and performing arts. Students can choose from over 200 major, minor and certificate programs, including several high-ranking graduate programs like its MD, Law, and MBA degrees. The university also offers its ever-popular Iowa Writer's Workshop, a two-year residency program in creative writing. The University of Iowa has graduate assistantships and more the 500 student organizations. Below are some helpful resources for potential and current students researching colleges in Iowa. The ICAN works with Iowa public school to increase access to post-secondary education for low-income and first-generation students. The program provides advisement, planning tools, support and other resources starting in middle school, and continuing through high school and college. The IJAG program works with students to remove barriers that may prevent high school graduation and college access. This is Iowa State's student financial agency, with financial aid resources for students and schools. Students can learn about adult continuing education, state scholarships and grants, loan repayment programs and other college resources. This website is a guide to transferring credits between Iowa's three Regent universities and 15 community colleges, and provides resources and information on topics such as advisement, reverse-transfer credits and distance education.